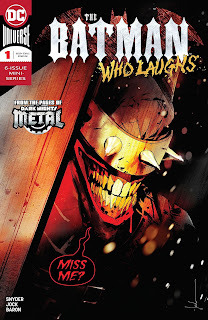 Yet Another Comics Blog: DC Comics Month-to-Month Sales: December 2018 - Who’s Laughing Now? DC Comics Month-to-Month Sales: December 2018 - Who’s Laughing Now? December was an odd month for DC, as (due to the end-of-year holidays) they only shipped three weeks worth of comics, holding off their normal fourth week comics until the first week of January. (This was a different tactic from Marvel, Image, and other companies, who instead squeezed their normal four week slate into the first three weeks of December). As a result DC only shipped 52 different comics during the month, their lowest total for a month since February 1991. But despite that, they had several strong sellers, and took the top five slots on the December Diamond-NA sales chart. Overall sales were the lowest in some time, but only off by 3% from November (when they had 67 different comics for sale). Note that this also means that January is likely to be a high point in terms of number of comics as they’ll be adding the delayed December fourth week to four weeks worth of January books. Also of note: Diamond released their list of the Top 1000 comics for 2018 in January, so I added in those revised sales estimates (indicated by the numbers in [brackets]). The 1000th comic had sales of 26,099, so any sales that were below that did not get revised. Please consider the fine print at the end of the column, as it explains several things about how these charts are compiled. It’s Scott Snyder and Jock, on a Batman mini-series, that is a sequel to last year’s smash hit crossover series. So yeah, it was always going to sell well. But I didn’t think it would sell this well, even with multiple covers, and especially at a $5 cover price. Even if it loses half of its sales by the end it will still be well over 100K. And it is doing far, far better than any of the other titles that spun out of Metal. So yeah, DC have to be quite happy with this. There are a few things that don’t make sense on the December charts, but chief among them are the sales on the second issue of Batman: Damned. Recall that, because of the controversy surrounding the first issue, DC has opted to not reprint it even though there was strong demand. But still, retailers ordered even higher on the second issue than they were able to get copies of the first. And also considering that a good number of copies of the first issue ended up in the hands of speculators, that means there’s a ton perceived demand for the second part of the story in print, even though the alleged readers would have had to have read it in a format other than print. DC continues to slip on its schedule, but past issues still adding reorders. Maybe it will finish up sometime in 2019? The good news for Batman is that it remains both DC’s and the market’s top-selling ongoing title. The bad news is that the most recent issue’s first month sales dropped below 90K for the first time since before the New 52. More bad news: we see that DC’s retroactively making Batman #50 returnable led to a sales loss of 28K copies. And not as much love for the Batman Annual this month. But let’s face it, December was a big hit on the wallets of Batman fans, so something had to give. Justice League sales take a bit of a tumble this week, losing over 8K one the span of the two issues. It’s still a good deal ahead of where sales were a year ago, but it’s a worrying trend. Reorder activity on Bendis’s Superman has been minimal, so it looks like retailers are doing a pretty good job gauging customer demand. Sales on Detective Comics have been remarkably stable over the past year. If you take away the sales on #990’s stunt cover, there’s only about a 4K difference between the high and low marks, and overall sales dropped less than 1% over the course of the year. Flash also only shipped one issue in December, but will have three in January. DC go back to the Martian Manhunter well once again, this time with a limited series that will intentionally run just twelve issues. They look to be trying to recapture some of that Mister Miracle magic, and the debut issue has first month sales a bit higher than Mr. M; but it also has nearly identical first issue sales to the previous Martian Manhunter series, and that one dropped like a stone. Wonder Woman also only shipped one issue in December, but will have three in January. A new creative team, coinciding with a hit movie, yet sales drop post-crossover. One of the rare cases when bringing in a guest star looks to end up having a long-term positive effect on sales, even after the guest star has left. Returns to monthly in January. Going to monthly starting in January. No sales movement on the over-sized and -priced issue. Ending with #50; no relaunch has been announced yet, but presumably will come sooner rather than later. Only one issue this month, but two in January, then monthly in February & March until ending with issue #36 in April. DC haven’t run a Freedom Fighters series since just before Flashpoint/New 52, so hey, why not give it another whirl? Though I think expecting it to hold up sales for a whole twelve issues is being a bit optimistic, I guess that DC are feeling optimistic about such things in the wake of Mister Miracle. Just a tiny blip up for the extra-sized and -priced 25th issue. Why aren’t you buying this? It’s SUPERGIRL AND KRYPTO HAVING ADVENTURES IN SPACE!! It’s everything you could want from a comic book! The top-selling non-DCU title for December. This month’s Vertigo debut, and the best first-month sales out of the debut issues of this latest batch of (non-Sandman Universe) Vertigo books. A couple more of the Sandman Universe titles. Which, while not setting the sales chart on fire, are still doing better than any other non-Sandman Vertigo series in recent memory. Actually a fairly decent second issue percentage drop. Sales go back up a fair bit this year. Ends with issue #13 in February. Ends with issue #16 in April. Ends with issue #36 in April. Ending with issue #12 in March. Final issue. And DC ended up making all four issue returnable, so the actual sales on this may end up being negligible. The lowest-selling DCU title for November. Ending with issue #8 in January. An expected second issue drop. Coming in at #221 is Sasquatch Detective #1, a $7.99 creator-owned one-shot mixing new material with reprints of back-up stories from the Snagglepuss limited series, with sales of 5,857. 12/2008: Scooby-Doo #139 -- ????? 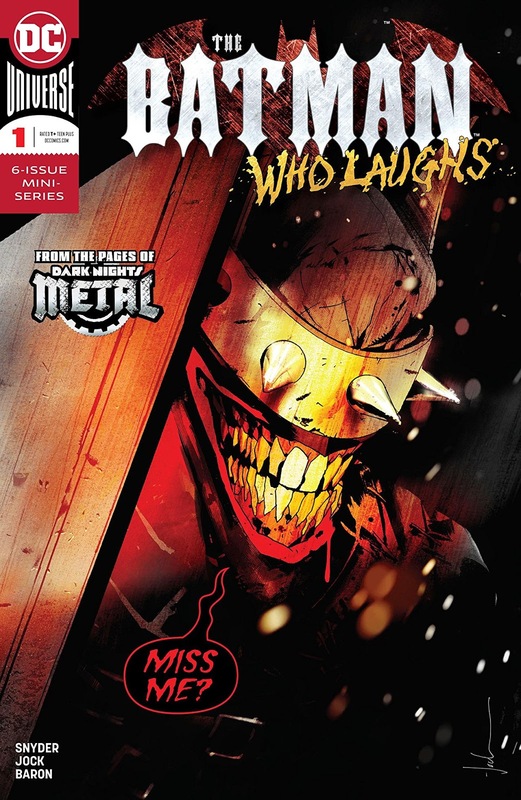 The lowest-selling new issue from DC in December. Vertigo average (6 comics): 13,207; Jinxworld average (3 comics): 9,381. Recall that DC only shipped 52 different comics in December (compared to 67 in November and 78 in October) due to their moving their fourth week titles to the first week of January. So while total sales are the lowest for a month in the Rebirth era, the average sales per title are rather good. Another way to look at it: sales dropped just 3% from November, despite releasing 22% fewer titles. Or compare to sales from December 2003, where sales are up 2% despite releasing 27% fewer titles. Frankly, DC would do well to consider reducing their monthly output of comics titles on a regular basis. DCU: Average: 44,269. Median: 28,006. No. : 40. Total: 1,770,779. Vertigo & Jinxworld: Average: 11,932. Median: 10,584. No. : 9. Total: 107,388. Digital First & Other: Average: 6,862. Median: 5,857. No. : 3. Total: 20,585. 0.6 - Scooby-Doo, Where Are You? Opinions expressed in this column are mine alone, and do not necessarily reflect those of my employer; The National Fellowship of Raceway Ministries; or my former neighbor's dog Miles. This article was originally published January 28, 2019 on Yet Another Comics Blog.